EPA Administrator Scott Pruitt released a memorandum to EPA’s regional administrators on December 7 entitled New Source Review Preconstruction Permitting Requirements: Enforceability and Use of the Actual-to-Projected-Actual Applicability Test in Determining Major Modification Applicability. Citing uncertainty created by recent appellate decisions in EPA’s enforcement action against DTE Energy, the memo seeks to communicate how EPA intends to apply and enforce certain New Source Review (“NSR”) applicability provisions. The memo signals a significant shift in approach toward NSR enforcement, and for major sources undergoing modification, may provide welcome clarity in performing pre-modification emission projections. Citing the NSR permitting requirements for major sources, the memo focuses on the NSR applicability triggers for an existing major source undergoing modification. For NSR to apply, the modification must first cause a significant emission increase, calculated as the difference between baseline actual emissions and projected actual emissions. “Projected actual emissions” is defined as the maximum annual rate, in tons per year, at which an existing emission unit is projected to emit a regulated NSR pollutant in any one of the 5 years following the date the unit resumes regular operation after the project, or in any one of the 10 years following that date, if the project involves increasing the emission unit’s design capacity or its potential to emit that regulated NSR pollutant and full utilization of the unit would result in a significant emissions increase or a significant net emissions increase at a major stationary source. 40 C.F.R. § 52.21(b)(41)(i). Thus, NSR requires major source owners and operators to perform a pre-construction applicability analysis based on projected actual emissions after the construction is complete. In doing such an analysis, the regulations direct the source to consider all relevant information, such as historical operational data, the company’s own representations, the company’s highest projections of business activity, the company’s filings with state or federal regulatory authorities and compliance plans under the approved State Implementation Plan. 40 C.F.R. §52.21 (b)(41)(ii)(a). Importantly, in doing such a calculation, a source may exclude “that portion of the unit’s emissions following the project that an existing unit could have accommodated during the consecutive 24-month period used to establish the baseline actual emissions …. and that are also unrelated to the particular project, including any increased utilization due to product demand growth.” 40 C.F.R. §52.21 (b)(41)(ii)(c). The regulations do not expressly require agency review or approval of these projections. Despite the self-implementing nature of the regulatory language, EPA has historically interpreted the projected actual emission calculation in a manner that tended to maximize the projected emission increase, even in the context of projects that source owners would not otherwise expect to cause increased emissions. For example, sources rarely operate continuously at maximum capacity, and therefore periods of low market demand may result in low baseline actual emissions. Market demand, and the source’s emissions, may be expected to increase after a modification project even when the project itself does not cause the increase or otherwise affect the unit’s pre-existing production capacity. In these cases, sources have sought to utilize the so-called “demand growth exclusion” to exclude a portion of the emission increase, but EPA and some state agencies have taken a very restrictive view of the circumstances under which the demand growth exclusion may be used. For that reason, major sources undergoing modification projects, even those that could be characterized as routine maintenance and repair, have done so with much concern that NSR requirements may be triggered or enforcement may result if an NSR permit was not obtained. Such was DTE Energy’s stance when EPA’s enforcement action focused on the adequacy of DTE’s pre-project calculations, even where no post-project significant emission increase occurred. [W]hen a source owner or operator performs a pre-project NSR applicability analysis in accordance with the calculation procedures in the regulations, and follows the applicable recordkeeping and notification requirements in the regulations, that owner or operator has met the pre-project source obligations of the regulations unless there is clear error (e.g. the source applies the wrong significance threshold). The EPA does not intend to substitute its judgement for that of the owner or operator by “second guessing” the owner or operator’s emissions projections. Finally, the memo indicates that in cases where a source projects that emissions increases will be less than the NSR thresholds, EPA will focus on the source’s post-project actual emissions in determining whether to pursue an enforcement action. In other words, although the DTE decision confirmed EPA’s authority to pursue NSR enforcement based on a source’s failure to perform a required pre-project applicability analysis or to correctly follow the calculation requirements of the regulations, EPA does not intend to pursue new enforcement cases in the absence of actual post-project emission increases that would have triggered NSR requirements. While Pruitt’s memo indicates that EPA’s new approach to NSR enforcement is consistent with President Trump’s directives to streamline requirements and reduce the regulatory burden on regulated sources, environmental groups have quickly criticized the memo as an indicator that EPA is reversing long-standing NSR enforcement initiatives. 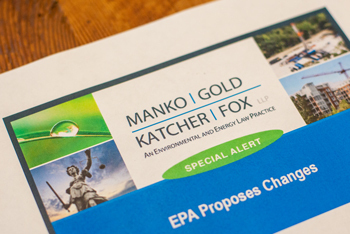 Despite these concerns, it would be difficult to challenge EPA’s exercise of its enforcement discretion or the memo itself, which states that it is not legally binding or enforceable and does not constitute final agency action. The impact of Administrator Pruitt’s memo on state NSR implementation remains to be seen; the memo notes that in the Clean Air Act scheme of cooperative federalism, state NSR programs may be more stringent than the federal program and have primacy once approved by EPA. Questions? Contact MGKF's Carol McCabe at 484-430-2304 for further information. For NSR to be triggered, the project must also cause a significant net emission increase, which takes into account emissions increases and decreases at the facility during a contemporaneous period.